Looking for a way to make someone's day? Purchase a Slice Gift Card! Gift cards are available at all of our locations. We value your commitment to our restaurant. 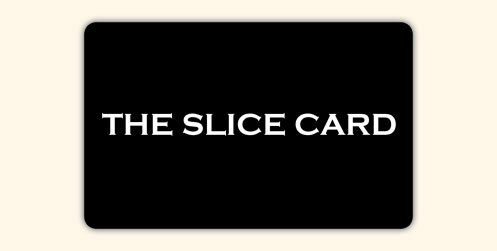 On your next visit to any Slice location, ask for your FREE ecard. You will need to return to this web site to register your card. Watch your points add up and redeem them for great Slice food on future visits! Present your Slice Card when you dine at any of our locations. You will receive 1 point for every $1 that you spend. For every 100 points you accrue, you will receive a voucher for a $10 credit on your next visit. The more you come in, the more you save. Earn 2 points for every $1 spent during your visit. When you register your card and include your email address, you will be emailed information on events and special offers at Slice. Your email address will not be shared with anyone. Card can be used at any Slice location. Rewards are not based on TAX or gratuity. Points cannot be combined with any other member. Only the person paying the bill will be credited with points. You may be asked for ID when using the card or redeeming points. Your card must be registered in order to redeem rewards. of purchase to receive points. Cards cannot be used between 12am-3am.